With the rise of the Berlin Wall, twelve-year-old Gerta finds her family divided overnight. She, her mother, and her brother Fritz live on the eastern side, controlled by the Soviets. Her father and middle brother, who had gone west in search of work, cannot return home. Gerta knows it is dangerous to watch the wall, to think forbidden thoughts of freedom, yet she can’t help herself. She sees the East German soldiers with their guns trained on their own citizens; she, her family, her neighbors and friends are prisoners in their own city. 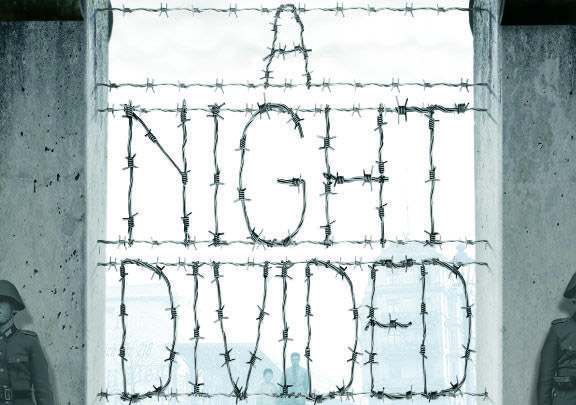 What made me interested in A Night Divided initially: You don’t get a lot of YA books about the Berlin Wall, so when I heard that A Night Divided centers around it, I knew I needed to read it. 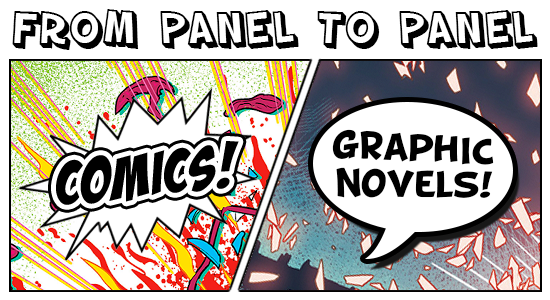 FROM PANEL TO PANEL | July + August Graphic Novel Releases I’m Excited About! Oh hey, remember this? Where I talk about comic books and graphic novels I’m excited about? It’s finally here! Apologies for the absence of this post last month. I was only excited about two comic volumes, so I procrastinated on the post. But hey, at least we have a lot of awesome ones that are out right now, right? Let’s talk about those July and August graphic novels I’m excited about (and you should too!). You’ll see ones by awesome writers like Brian K. Vaughan (Saga), Kieron Gillen (The Wicked + The Divine, Phonogram), Marguerite Bennett (A-Force, DC Bombshells), and many more. 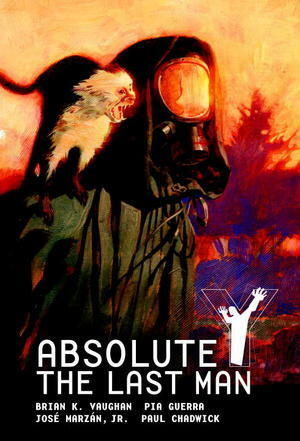 Written by Brian K. Vaughan (Saga, Ex Machina, Runaways, Pride of Baghdad) and illustrated by Pia Guerra, this is the saga of Yorick Brown—the only human survivor of a planet-wide plague that instantly kills every mammal possessing a Y chromosome. Accompanied by a mysterious government agent, a brilliant young geneticist and his pet monkey, Ampersand, Yorick travels the world in search of his lost love and the answer to why he’s the last man on earth. This Absolute Edition will feature the first twenty issues of this action-packed series along with special script pages, character sketchs and cover gallery. Why I’m excited: I’m a big fan of Brian K. Vaughan’s work because of Saga, so I’ve wanted to read more of his works. Y: The Last Man is one of Vaughan’s well-known comics, and lots of people have sung praises about this comic. I find this comic intriguing because it sounds like it has awesome world-building and trippy story lines. I know I can get the trade paperbacks, but I kind of want to get this hardcover because it has an awesome slip case. What do you get when Buffy Summers didn’t slay vampires and isn’t a girl? You get Theseus Cassio Lowood, mostly known as Cas, the ghost slayer. Cas’s job: to kill the dead that should’ve stayed dead. No, not zombies. Ghosts. Cas inherits two things when his dad dies: 1. the ghost-hunting job with the intention of avenging his death, and 2. his dad’s athame that has powers effective enough to kill the dead. He follows and investigates the ghost lores his trustworthy contacts tips him with, which sends him all over the country, never sticking long enough to make friends. After Cas kills County 12 Hiker, he, his white-witch mom, and their cat Tybalt, leave for Thunder Bay in Ontario, Canada, where he goes in search of the ghost, Anna Dressed in Blood. There, he discovers that there are other powers lurking in the shadows. In need of new fonts? I’ll take your silence for a YES. In this batch of fonts, you’ll see a lot of gorgeous lettering that make your eyes turn into hearts, and lined fonts that cut into the letters. Go forth and add these fonts to your font book! 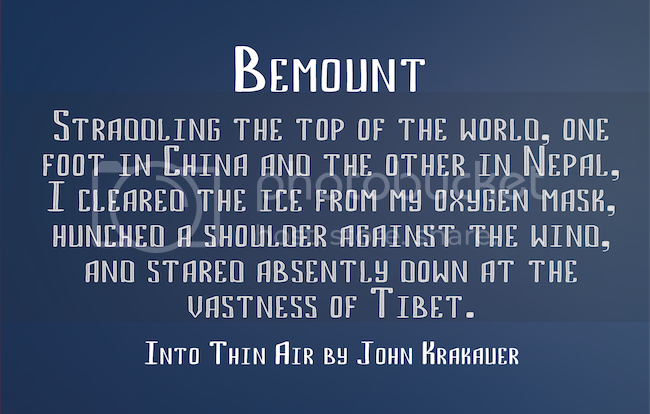 Bemount is designed by Anton Chernogorov. An astonishing literary debut about a young man who, in the search for clues into the disappearance of his mother twelve years earlier, discovers himself in the process. Recent high school graduate and aspiring artist Walter Stahl lives with his ailing father in the dregs of Las Vegas, their lives overshadowed by the disappearance of Walter’s mother, who drove off when he was five and never returned. Although Walter has never so much as seen a photograph of his mother, it doesn’t stop him from keeping an eye out for her in the groups of tourists he caters to in his dead-end job along the Strip. Then Walter meets Chrysto and Acacia, a brother and sister working as living statues at the Venetian Hotel, and his world cracks open. Spending less time caring for his father, and more time riding on the backs of Vespas and drawing, Walter finds life has more to offer than he could have imagined. But as his feelings for Chrysto deepen, and as clues behind his mother’s disappearance start to reveal themselves, Walter is forced to face the truth about himself and his family history. Threading through this coming-of-age story are beautiful and heart-wrenching graphic illustrations, depicting how Walter’s mother Emily, a Vietnamese-born accordion player, abandoned her family to chase a vision of Liberace across the country; and how Walter’s father went searching for her amongst the gondolas of the Venetian Hotel. In Still Life Las Vegas, the magical collides with the mundane; memory, sexual awakening and familial ties all lead to a place where everything is illuminated, and nothing is real. What made me interested in Still Life Las Vegas initially: It’s a hybrid novel—part prose and part graphic novel—and has a half-Vietnamese gay protagonist! These are things that you don’t see often in books, so I instantly knew I had to read it. Would you say no?